Description: Known as Model 1, this is the US Launch system. Power and Reset buttons are oval shaped. This is a list of VGCollect users who have Sega Saturn (MK-80000) [NA] in their Collection. This is a list of VGCollect users who have Sega Saturn (MK-80000) [NA] in their Sell List. 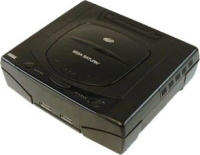 This is a list of VGCollect users who have Sega Saturn (MK-80000) [NA] in their Wish List.